Much more AFTER THE JUMPThe Grand Gesture The biggest problem of the compulsively tell-don’t-show second season was that dialogue too often replaced action to demonstrate character development. As if to say, “We’re Done Doing That!” we are treated to a silent cold open. Each movement tells us something about the characters. And it didn’t devolve into a pointless action sequence. They saw Walkers and got out of dodge. You know… LIKE EXPERIENCED SCAVENGERS WOULD! What Show is This? After literally two season of all the characters acting the exact same no matter what happened, we… get.. affected characters. Carl isn’t a liability. Rick is a stoic leader who has finally had enough of Lori’s manipulations and can barely stand to look at her even as he sacrifices his own meager dinner for (what he has been told and possibly believes to be) his unborn baby inside her. T-Dog… Well, T-Dog is still T-Dog. Seriously, What Show is This? Then, THINGS HAPPENED. They found a prison. Rick made a decision that made sense but was hard to bare. We saw, if even just for a moment, a quiet moment of leadership dynamics without someone yelling, “I am tired of your leadership dynamics, Rick!” Even when Lori meekly protested it gave us a chance to see how their relationship has soured since we last left them. Look How Far We’ve Come We begin the episode and they are on the road. We see the method to their madness and that they are tracking the walker herds which dictates their movements. They stumble upon the prison and make their way into the yard before pressing into a cell block and then further in. Doesn’t plot movement feel good? Seriously, close your eyes and let the momentum brush through your hair. Still Vile After All These Years The one pitch this show never lost was the gore and boy, do they not disappoint. The gas mask face guy. Disembodied head on the floor guy. The ol’ chop-a-roo for Hershel so he doesn’t turn into a Hershel Walker. Also, did I mention that 10.9 million people watched this show last night. Bigger than anything on anything this fall. Cable. Broadcast. Anything. Everything. In comparison, mega-hit Modern Family pulled in 5.5 million. The Walking Dead is the biggest scripted program on television. And it included someone’s leg getting violently hacked off with close ups of the wound bleeding out. A Continuing Plot Then, with the revelation of the Prison Gang we get a twist at the end to whet our appetite for next week. Sure, if you read the comic you could probably see it coming, but still. Intrigue! Mystery! Further plot momentum! The social struggle between The Ricktator and the prison survivors is a great 3-4 episode arc. Hopefully they don’t drag it out. Please don’t drag it out. I had such a good time this week, Glen! Please, don’t make us go back! DON’T MAKE US GO BACK to episode after episode that ends with characters just looking angrily at each other as feuds we don’t care about continue to simmer. Make sure you save any conversations about babies and birth until YOU’RE EIGHT MONTHS PREGNANT! I’ve decided to read Justin’s recaps instead of watching the show… I think they’ll be more enjoyable to me! It picked up a bit, but it also laid down enough dramatic moments that should be parsed through action, yet could very well lead to synchronized whirlpools of dialog. Can’t you just see Rick and Lori having the same discussion over and over and over again about the baby’s daddy and their marriage? I worry. Also, the prison wasn’t that far off from their location in last year’s season finale. They’ve been wandering for quite some time (Carl seems to be experiencing some “changes”). 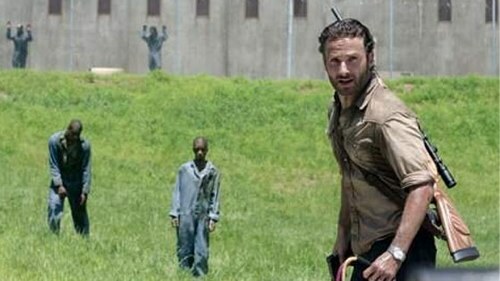 Did they just circle the prison for months while tracking walker herds? Odd. I’ve listened to a number of interviews with Mazzara, and he doesn’t fill me with loads of confidence. He’s not bad, but he’s often a bit defensive about the writing choices he’s made. That said, they let Ernest Dickerson direct this episode, and that’s important. If the past episodes are any evidence, the more they let Dickerson run the show, the better the product will be. Of all their directors, he brings the most cinematic eye. Is there anything more boring then a 7 minute action sequence of slaying what I’d estimate to be three to four dozen zombies? OK, don’t answer that, we’ve probably all seen season 2. Still, if that’s the high point for a drama series, then I give up. The “too much zombie killing” criticism is valid. It’s hard to take is seriously after a while, specifically when Rick is shooting people in the head on the run Grand Theft Auto style. That being said, the different between Walking Dead and Breaking Bad is about 7 million viewers. You have to wonder how many of those tune in for high octane suspense action and not character development. I wonder if (and fear that) the producers took last season’s elation after having dealt with the barn as a sign that every episode moving forward needs a massive culling. That could get tedious very quickly. I think your reference to BSG was interesting, as I found the first part of season 3 to be quite frustrating with its completely changed dynamic. Cylons didn’t get more interesting when they were around all the time, much like the Borg didn’t gain from increased exposure. Ultimately, much like the Borg and the Cylons, the Dead are only a foil for the human story to develop against. If the show runners have run out of ideas on how to play the group dynamic after two seasons, I hope they take the chance of adding fresh blood to shake things up and plant new seeds, instead of simply replacing useless regurgitation of the ever same tropes with mindless gore. As for the number of viewers, you’re right, maybe mindless gore is what makes TWD successful and then more power to whoever figured that out. Alas, that change of direction would take me right out of the target demographic, but best of luck to them going forward.